If you are having trouble reading this e-mail, please click here. Bob Kramer has been a circus clown, a magician, a chef, a waiter, and a traveling knife sharpener. But it's his ability to slice through a one inch thick rope with one swing and hack through a 2X4 that's helped him achieve rock star status with chefs all over the globe. Kramer is one of only a hundred and three people in the world, and the only former chef, to be certified as a Master Bladesmith. His custom knives sell for $300... per inch. So figure you'll pony up $2400 for a basic 8-inch chef knife. Add to that there's a waiting list of well over a year to get the shiny object in hand. Why the cost and wait time? 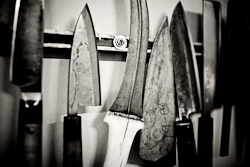 Kramer makes each knife himself using a multi-step process which encompasses as many as 200 layers of steel. The outcome is a stunning Damascus steel blade with a swirling pattern resembling wood grain and is harder, thinner, sharper, and slices and dices with ease and perfection. If you don't feel like waiting for your own custom blade, Sur La Table and Williams-Sonoma currently sell more affordable and ready made versions of the Kramer Knives. Click here to see chef Erik Desjarlais' article: Bob Kramer is like Clapton, or God, plus a CBS News video profile.